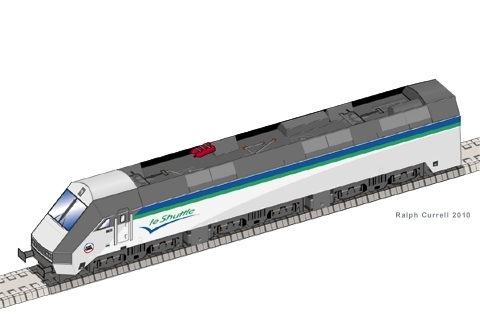 This model builds into a 1:160 scale replica (N Gauge) of a Class 9/0 Shuttle locomotive in its original ‘Le Shuttle’ livery, and is approximately 5½ inches (13,5 cm) long when complete. shuttle_loco_instr.pdf - 159 KiB - This document contains the instructions only (3 pages). shuttle_loco_parts.pdf - 309 KiB - This document contains the parts for the model (1 page). The Channel Tunnel, running beneath the English Channel between Folkestone, England and Coquelles, France, opened in 1994. The tunnel is used by Eurostar passenger trains and roll-on/roll-off vehicle shuttles. Two types of shuttle train are employed, one for freight vehicles using semi-open wagons, and another for passenger vehicles with enclosed wagons. Both passenger and freight shuttles are hauled by Eurotunnel Class 9 electric locomotives. They have a triple-bogie (Bo-Bo-Bo) wheel arrangement and are powered by 25 kV drawn through a pantograph from overhead lines. Two locomotives are used on each Shuttle train, one at either end, each having sufficient power to move the train should one locomotive fail. In total 59 were manufactured, and many are named after famous opera singers. Eurotunnel Class 9 - The Wikipedia entry gives a good overview of the history and technical details of the locomotive. Eurotunnel Tri-Bo - From the Kent Rail site, this page gives further details, including the opera singer names given to some of the locomotives.